But I don't even include folks like Rupaul in the mix! Two thumbs up Chuck!! She's not just beauty either. 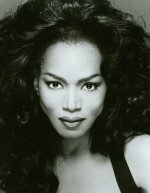 She graduated from Yale University (1980), receiving her B.A. in African-American studies. She'd probably like this site given her major.